Summer Solstice is approaching, on June 20th this year, and I’m reflecting on gratitude and prosperity. Whenever the sun-feasts come around, I find it to be a time of reflection for me. In Autumn, I find I’m starting to turn within, I reflect my gratitude for the bounty of gifts the summer has brought, and start preparing for the next phase of my own internal journey through this life. In Winter, I’m reflecting the life I want to create for myself, the seeds I’m planting in the cold dark ground for next year’s harvest. In Spring, I am giving thanks for the return of the growing season, and reflecting the sun and rising green out into my garden and world. But Summer! How exciting! This Summer Solstice I am giving thanks. I reflect my gratitude for all the gifts I’ve been given, and the wonderful journey I’ve had so far. My spiritual family is flourishing, the garden is a riot, and my pantry and freezer are filling with the earth’s bounty. The flood of backyard produce has started; friends and neighbors have enough to share and more. 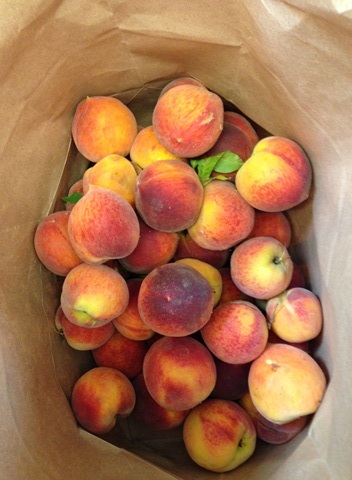 This past week two coworkers have been nearly as grateful to give away as I have been to receive: 10 pounds of peaches and 15 pounds of apricots. So I got out the canning pot. The peaches were cling-stone, which are a lot harder to process if you want halves or slices, and most of them were so ripe that the obvious answer was to make syrup. The end result was some hybrid of syrup and sauce, because I didn’t want to juice and strain (to make clear syrup) and make even more mess, so I simply skinned them and removed the pits. Added sugar, some coriander and cinnamon, a bit of lemon zest, and boiled that until it got to 220 degrees (F). The result is sweet and subtle, and surpassed my expectations, especially mixed with sparkling water as an Italian Soda type drink. A few peaches were firm enough that I decided to have a go at canning them whole. The syrup turned a lovely rose color. Not sure how these will taste but they sure look good! 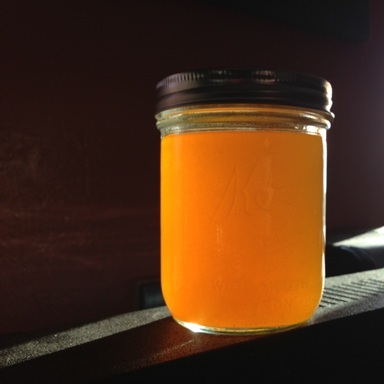 I canned the apricots as halves in extra light syrup. I always find grocery store canned fruit too sweet, even if it’s done in fruit juice, so I really appreciate having a pressure-canner and being free to not-sweeten things as much. 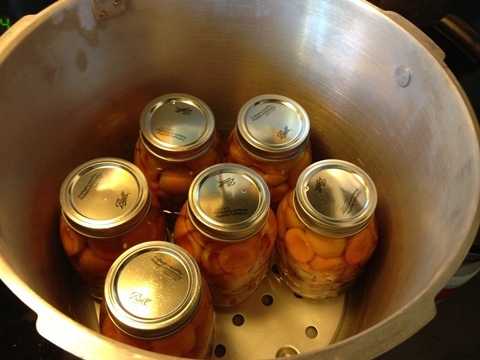 Extra-light syrup is 1 ¼ cup sugar in 5 ½ cups water, and the resultant canned apricots are about the same sweetness as they would be eaten fresh. This is true prosperity. I have enough. We have enough! My coworkers have enough fruit that they can give it freely. I have enough that I can put some by for the future, and have enough to give that freely to my friends as well. This kind of work, even doing it when it’s 110 degrees outside, is deeply satisfying, and settles the instinctive self firmly in the present. Preparing and sharing food is one of the things we as beings have been doing the longest. Thank you, coworkers! Thank you, apricot and peach trees, the earth that grows them and the sun that shines on them, and the bees that visit them. May the summer sun light your days, and fuel your dreams. May you find that prosperity is present for you here and now, in the ways that truly matter. 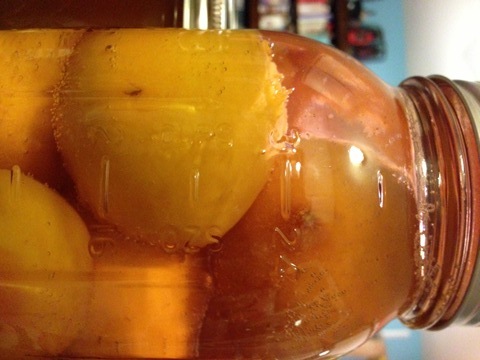 This entry was posted in Garden, Spirit and tagged apricots, canning, garden, gratitude, peaches, prosperity. Bookmark the permalink.